You can also check Video partners on the Display Network. Here is where you set you daily budget, the location where you wish to show your video advert,the video language, and the device type. Targeting is more specific on this type of True View video adverting. True View,in addition to the more specificity in targeting,also,lets you choose between in-stream viewing or in-display viewing. The interesting piece about True View,is the relative cost per click. You’ll be charged the CPC only if a viewer clicks your attached URL,watches the ad for more than 30 seconds, or watches the complete less-than-30-second video advert. In-Stream video adverts are set up to capture the attention of your prospects in the first five seconds of the ad. You’ve seen these where it counts down from 5 and then goes to a “Skip Ad” button.If the viewer skips your ad by clicking the “Skip Ad” button,your advert will acquire no cost to you. In-Display YouTube adverts are the ones that appear to the right side of content you are viewing on YouTube. In-display video adverts can run across YouTube in-display as well as the Google Display Network. YouTube runs in-display on the search and watch pages for both desktop and m.youtube.com. They’re also run on home pages for desktop and YouTube mobile apps. The video advert is actually an image thumbnail and up to three lines of text. Clicking the image advert activate the embedded URL to the YOUTube watch or channel page to view the video. Expert YouTube advertisers use CTA overlays on the videos to drive the users to the advertiser site. You actually create the CTA overlay in AdWords and only one overlay may appear per video at a time. 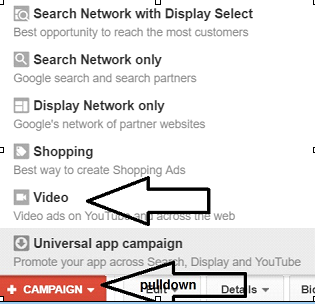 To create a CTA overlay in AdWords for an existing video campaign, follow these steps. Click the Campaigns tab, and then select the video campaign you want to edit. At the Videos tab,click the drop-down menu next to the video you want to edit and select edit Call to Action,enter the required URL and landing page information. Monitor and analyze to know if you are targeting the customers who are interested in your offer. Recall, the good thing about PPC is that you’ll have customers seeking out your advert rather than the other way around. PPC,like SEO, is more precise and Video Search,with the correct keywords, is like SEM/Google textual Search. Visit Analytics and learn about your viewers. You can ascertain which video your audience is watching and the time in which they stay on the video,by using “audience overview” under “Reporting”. Figure out if you’re reaching the right audience. Check your AdWords account to track views, costs, and budget details. Reporting for TrueView campaigns,in YouTube “Analytics” “Overview” include which videos your customers are watching,how long they are watching them,demographics,traffic sources,devices subscribers and other relevant reports. To get to YouTube Analytics,click “Video Manager”. Take a look at this Goggle support page to get all the relevant analytics that come with a True View selection. Obviously,television and radio advertising is very expensive because you reach out to a huge non-targeted audience. YouTube advertising is really more cost effective,but you have to monitor and adjust your targeting. If you measure carefully and constantly tweak your advertising strategy and targeting, you will see that even small online businesses and their small budgets can surpass their marketing goals. The CPC will continue to go down,if your fine tune your video advert, and your targeted audience in True View. Recall, you will not be charged a CPC if the video is viewed for less than 30 seconds,if the viewer doesn’t view the entire less-than-30-second video, and no action is taken as far as clicking on the advert’s landing page link. First sign into your Adwords account,then click next to your Adwords account name at the top of the page. On the Linked Accounts page, click YouTube,then on the YouTube Channels page click “+CHANNEL”, which will bring up a “Link a YouTube Channel Box. In the box simply paste your YouTube channel URL You can also do this in the opposite direction,more on that further below. If you don’t have it,be sure to get your Google Adsense ID. Then, if you haven’t monitized your videos,be sure to monitize them from your YouTube Channel. Just go to your YouTube Channel from your URL,then go to “Channel” and click “monitization”. On the Adsense monitization page you can install your Google Adsense 16 digit ID.